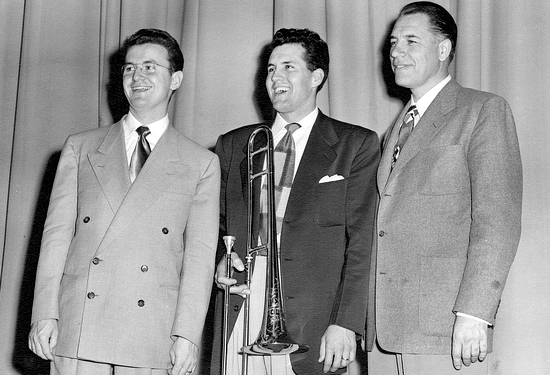 The Early Music Team: Cliff Barrows (center), Billy Graham’s longtime music director with pianist Tedd Smith (left) and soloist George Beverly Shea (right). 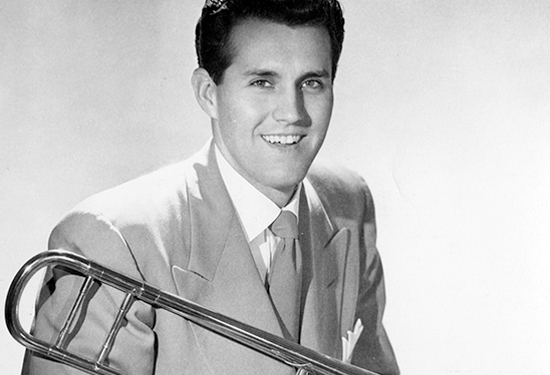 A young Cliff Barrows played his trombone in the early Billy Graham Crusades. 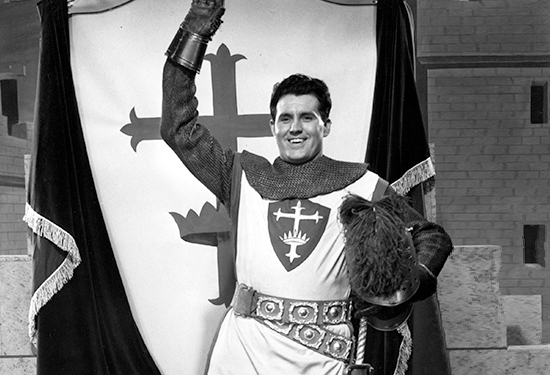 Cliff Barrows doing an early television show for children called The Silver Shield. 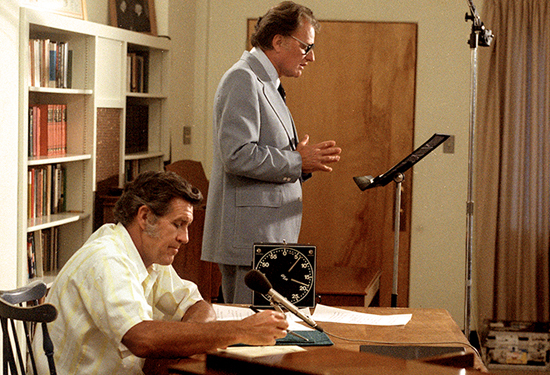 Cliff Barrows in a recording studio with Billy Graham as he directed The Hour of Decision radio show. 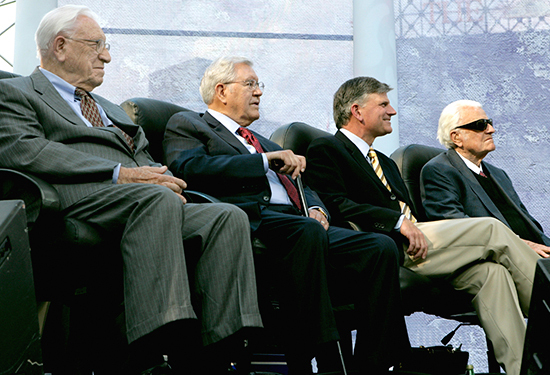 (Left to right) George Beverly Shea, Cliff Barrows, Franklin Graham and Billy Graham at the 2006 Baltimore Festival, where Franklin and Billy Graham shared the preaching. 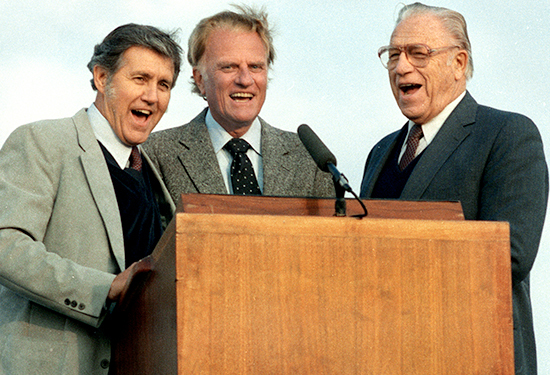 (Left to right) Cliff Barrows, Billy Graham and George Beverly Shea singing “This Little Light of Mine” in 1984 in Sunderland, England. 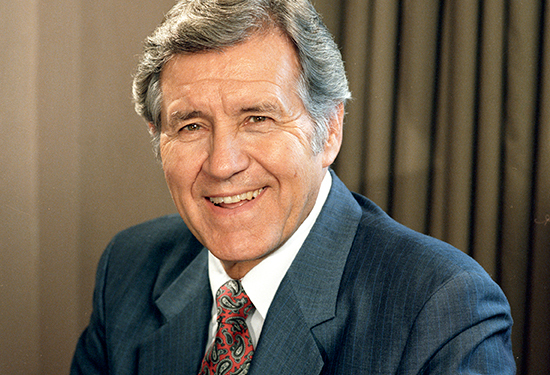 Cliff Barrows served as Crusade Platform Director, for Billy Graham’s Crusades around the world. 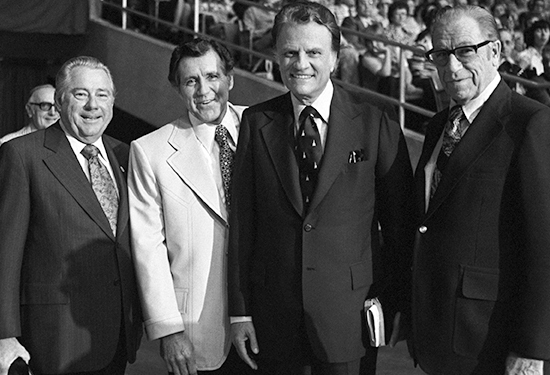 The original Billy Graham team, left to right: Grady Wilson, Cliff Barrows, Billy Graham and George Beverly Shea. 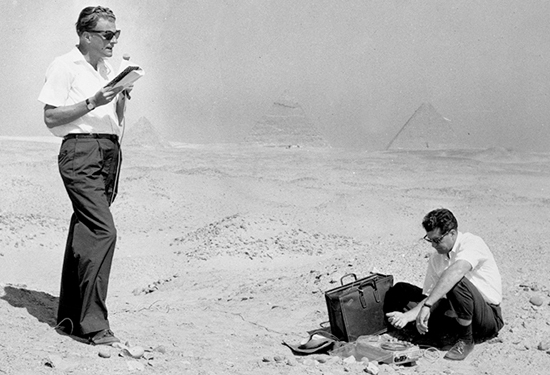 Cliff Barrows recording The Hour of Decision broadcast in Egypt near the pyramids. 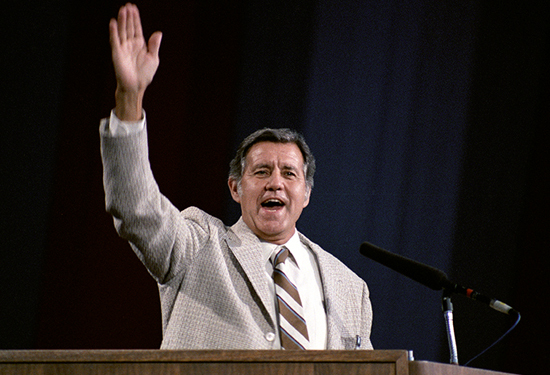 Cliff Barrows, song leader, directing the congregation in song during in Amsterdam in 1986. 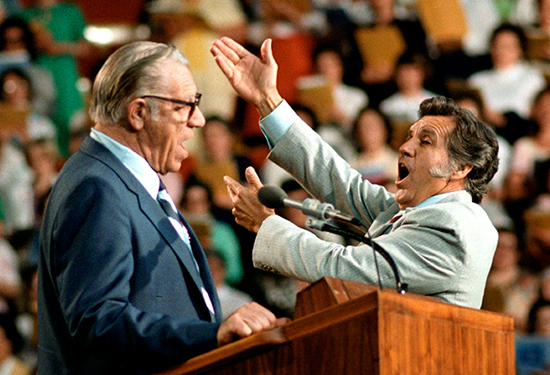 Cliff Barrows and George Beverly Shea singing “How Great Thou Art” during the 1980 Indianapolis, Indiana, Billy Graham Crusade. 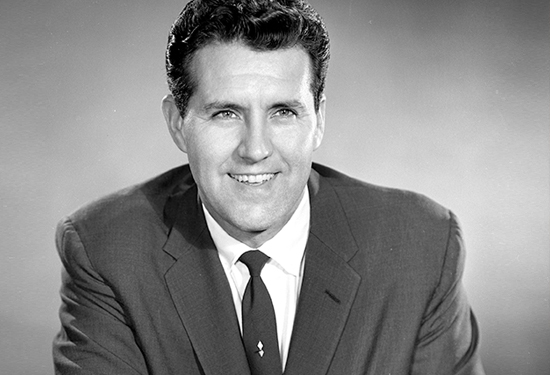 A young Cliff Barrows, music director for Billy Graham’s Crusades. 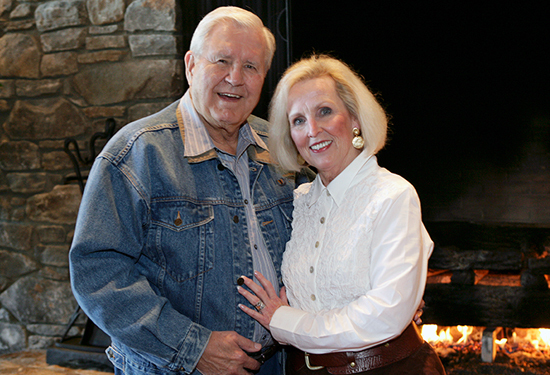 Cliff Barrows and his wife Ann in 2007. 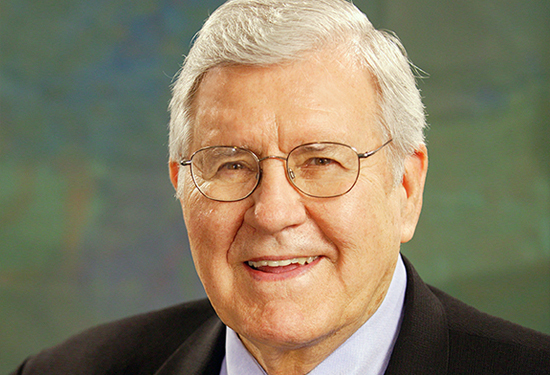 In October 2016, Mr. Barrows talked about how he was “totally dependent” on his “precious wife,” who took care of him when his eyesight failed and who was by his side until the end.